Nintendo's ingenious Labo concept is back with Toy-Con 03, aka the Vehicle Kit. 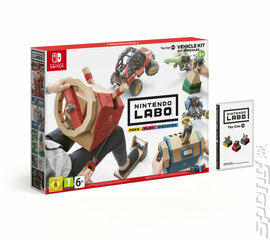 A quick catch-up for anyone who missed the first two Toy-Con kits - Labo is a wonderfully simple and wonderfully brilliant idea. In a nutshell, it's a carboard cut-out construction kit that houses various elements of the Switch's control devices. Players have to DIY their kits to create all sorts of weird and wonderful devices - in this case, the devices they need to control a buggy, a plane and a submarine. For many, this will be the first kit that comes with what feels like a full game. Following in the footsteps of Pilotwings, it has you exploring open world environments and completing different missions as you do. In the buggy, for example, you have to knock giant golf balls into holes, blow up boulders and deliver plastic cows to their homes. The real joy of it, though, is how tactile it all is. The steering wheel for the buggy, for example, also comes with an array of levers and cords for fine control of your on-screen vehicle. The solid corrugated cardboard construction means the kit is built to last, and with plans to roll your new controllers out to other games, too, there's a world of possibilities at your fingertips!